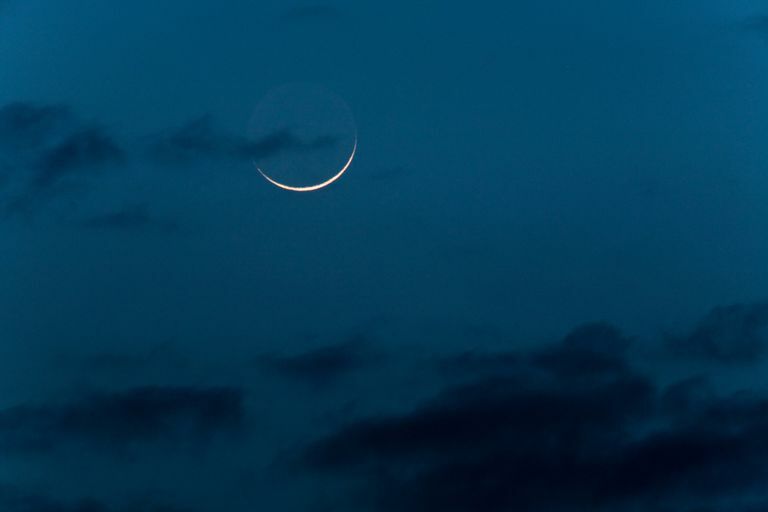 What Is the Meaning of the New Moon? New Moons are special, as a time to unfold into your real self, the timeless one. If it's true that we rest between lives, in our real home, the New Moon is a time to rest, before the next cycle of happenings. Because of that, it's one to get juiced up again, by merging with that renewing, spiritual source. And like other moments of soul searching, like the Sun's "New Moon" at Winter Solstice, it's a time to remember who you are and get guidance on the road ahead. When the Moon is new, the Luminaries -- the Sun and Moon -- are aligned in the same Zodiac sign. That makes it a charged time with concentrated energies of that sign. A New Moon is a symbolic point of attention and a symbolic portal for new beginnings. New Moons are a great time to set intentions for things you'd like to create, develop, cultivate, make manifest. There are many ways to initiate this communion with the Universe from lighting a candle to elaborate rituals. What matters is that you're committing yourself to your vision, and open to receiving guidance, healing, support from Spirit. When you tune into the Moon's phases, it's reassuring to know that there are many chances during the year to tap into lunar energy. Like the tides, the Moon ebbs and flows, a rhythm that women understand intimately. New Moons are a blank page on which to speak your dreams out loud, and Full Moons are for taking action and celebrating the fruit of your efforts. In the chaotic and temporal world, looking to something larger that is also part of yourself can fill you with awe and make you feel connected. For whatever path you're on, opening to working with planetary energies links you to the power of the divine. It's a good idea to spend some time reflecting in the days leading up to the new Moon. Knowing exactly what you want to draw into your life is not always easy. Part of preparing for the new Moon is making sure you are clear about your intentions. Sometimes it's a quality you'd like to cultivate like forgiveness, courage -- other times it's a more specific request for a promotion at work or a new place to live. What Is a New Moon Ritual? This depends on your personal tastes, the pace of your life and the time you have to devote to it. Some simply light a candle, while others gather objects and pictures for their altar. Try writing your intentions on a 7-day candle and leaving it in a prominent (and safe) place. With a candle, you can return to it and relight it while meditating on your intentions. Ritual helps focus your entire being on the quest at hand. In the days leading up to the new Moon, you might gather pictures and totems that symbolize your goal. Creating a New Moon collage gives you a visual reminder of your dreams. What Does It Mean for Each Different Zodiac Sign? Every new Moon is different, and this gives you the chance to claim the energies of each different sign. Even if you don't have planets in the sign for a given month, it falls somewhere in your birth chart. We each have elements of the entire Zodiac in our make-up, with some more emphasized than others. Find out where the new Moon falls in your chart for clues as to what to "call in" that month. How Is It Different From the Full Moon? The new Moon has a more inward feel, has a void or empty quality, and therefore can be frightening to those not comfortable with uncertainty. Can you learn to trust the dark? It's the moment when the old passes away and the new is not yet here. That's why it's a powerful time for sending out your prayer, wishes, desires to the Universe. Were You Born at the Dark of the Moon? What's the First-Quarter Moon Personality?